Jerry Durant’s two-time stakes winning colt B. B. Dude tops the third and final edition of the $300,000 Spendthrift Juvenile Stallion Stakes on Sunday’s “Stars of Tomorrow I” card at Churchill Downs. The seven-furlong Spendthrift Juvenile Stallion Stakes, a race for 2-year-olds that were sired by Spendthrift-owned stallions, has a purse structured with a unique $150,000 to the owners of the placed horses, with the other $150,000 allocated to award breeders of the first-through-fourth-place finishers. Specifically, the winning breeder will earn $60,000 with $40,000 going to the breeder of the runner-up, $30,000 for third and $20,000 for fourth. Spendthrift Farm has announced the discontinuation of the Spendthrift Stallions Stakes at Churchill Downs after 2018, citing a refusal by the North American International Cataloguing Standards Committee to give black-type consideration as the reason. B. B. Dude, bred in Kentucky by Sally Thomas and New Dawn Stable, is a 2-year-old colt by Shakin It Up out of the Unbridled’s Song mare Purrfect Song. The Steve Asmussen trainee was successful in three out of his four-career starts. Most recently, B. B. Dude won the Sept. 30 Kip Deville Stakes at Remington Park and was victorious in the Aug. 18 Manzano Stakes at The Downs Racetrack in Albuquerque, N.M.
Asmussen’s first-call rider Ricardo Santana Jr. has the mount and will break from post position No. 5. Chief among B. B. Dude’s competitors is Merriebelle Stable’s homebred Into the South, who finished fourth in the Oct. 9 Matron (GIII) at Belmont Park following her maiden-breaking score over the Saratoga dirt surface on Aug. 26. Trained by Ignacio Correas IV, Into the South will be ridden by jockey Florent Geroux and will break from post 8. Among the challengers in the nine-horse race is Five 02 Racing and Bob Bradley’s gutsy maiden winner Distorted Jimmy for trainer Norm Casse. 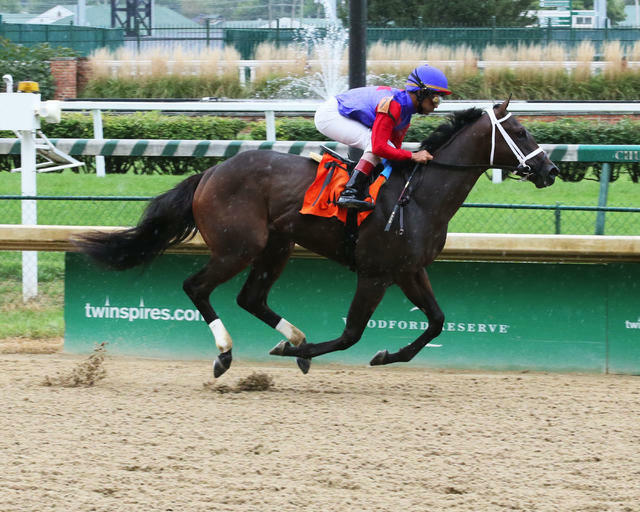 The colt by Jimmy Creed has been targeting this race since his maiden-breaking performance on Sept. 15 at Churchill Downs, according to the 35-year-old conditioner. Distorted Jimmy was bred in Kentucky by Judy Clemow. The Spendthrift Stallion Stakes is carded as Race 10 of 11 Sunday with a post time of 5:36 p.m. EDT. The complete Spendthrift Juvenile Stallion Stakes field from the rail out (with jockey and trainer): Achilles Warrior (Julien Leparoux, Mark Hennig); Distorted Jimmy (Robby Albarado, Casse); Gentle Warrior (Chris Landeros, Ian Wilkes); Kajawa (Jack Gilligan, Michelle Lovell); B. B. Dude (Santana, Asmussen); Dunph (Tyler Gaffalione, Mike Maker); Casa Creed (Junior Alvarado, Bill Mott); Into the South (Geroux, Correas); and Naughty Joker (Julio Garcia, Wesley Ward). LOUISVILLE, Ky. (Thursday, Oct. 25, 2018) – Anne and Ronnie Sheffer’s impressive five-length maiden winner Take Charge Angel hopes to advance to the next step in her career by tackling stakes company in Sunday’s sixth running of the $100,000 Rags to Riches Overnight Stakes at Churchill Downs. Run at one mile on the main track for 2-year-old fillies, the Rags to Riches annually serves as a prep race for the 1 1/16-mile Golden Rod (Grade II) on the closing weekend of the Fall Meet at Churchill Downs. The Rags to Riches is carded as Race 8 Sunday with a post time of 4:36 p.m. (all times Eastern). First post is 1 p.m.
Take Charge Angel, a 2-year-old daughter of Will Take Charge, rallied from a half-length off the early pace in her debut win on Sept. 22 at Churchill Downs to defeat eight rivals by a widening five lengths. Cox hopes Take Charge Angel can follow in the same footsteps as his stable star Monomoy Girl did last year. The multiple Grade I winner cruised to a 6 ½-length victory in the Rags to Riches and eventually won the Longines Kentucky Oaks and is currently one of the top contenders for the Longines Breeders’ Cup Distaff (GI) on Nov. 3. Take Charge Angel is out of Sheffer’s two-time winning mare Georgie’s Angel, who won her debut at Churchill Downs by 6 ¼ lengths prior to tackling Saratoga’s Schuylerville (GIII) by 1 ½ lengths in 2011. Jockey Shaun Bridgmohan rides Take Charge Angel who will break from post position No. 6. One of the challengers to Take Charge Angel in the nine-horse Rags to Riches field is Del Mar Debutante (GI) runner-up Mother Mother for Hall of Fame trainer Bob Baffert and owners George Bolton, Barry Hall, Barry Lipman, Mark Mathiesen and Andrew Molasky. Mother Mother, a 2-year-old daughter by Pioneerof the Nile by the Lion Hearted mare Mother, drew clear to a 6 ½-length win in her debut on July 22 and Del Mar prior to her runner-up finish behind Bellafina, who is one of the top contenders for the Tito’s Handmade Vodka Breeders’ Cup Juvenile Fillies (GI) on Nov. 2. Jockey Florent Geroux has the call on Mother Mother who drew post 2. Other major contenders in the Rags to Riches include: Jessamine Stakes (GII) fifth-place finisher Princesa Carolina, who was supplemented to the race for $500 by trainer Kenny McPeek and owners Three Chimneys Farm after she did not make the pre-entry field of 14 for the Breeders’ Cup Juvenile Fillies Turf; Alcibiades Stakes (GI) fourth-place Chocolate Kisses for owner Debby Oxley and trainer Mark Casse; Spendthrift Farm’s recent three-length maiden winner Into Mystic for trainer Todd Pletcher. The complete Rags to Riches field in order of post position (with jockey and trainer): My Wynter Rose (Cory Orm, Tommy Short); Mother Mother (Geroux, Baffert); Love My Honey (Robby Albarado, Mike Maker); Into Mystic (Tyler Gaffalione, Pletcher); Princesa Carolina (Ricardo Santana Jr., McPeek); Take Charge Angel (Bridgmohan, Cox); Molto Bella (Brian Hernandez Jr., Ian Wilkes); High Regard (Corey Lanerie, Vicki Oliver); Chocolate Kisses (Julien Leparoux, Casse). All fillies will tote 118 pounds except My Wynter Rose who will carry 120.